Region: This insect is found throughout North America. Life cycle: This bug produces one to two generations each year. The adult females hibernate in any place that offers protection, including houses and barns. On warm winter or spring days, they come out into the open and return to the trees where they spend summer. In fall, they congregate on trunks of trees, fence posts, and exterior surfaces of buildings. Physical Description: This grayish brown to black bug has three red stripes on the thorax and thin diagonal red lines on the upper part of the wings and is about 1/2 inch long. It lays its eggs on bark and leaves, and the nymph is a bright red. These insects are true bugs and have sucking mouthparts. Feeding characteristics: This bug prefers the boxelder, but also may feed on various fruit trees, as well as maple and ash. 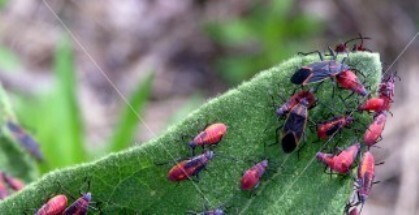 They feed on foliage and flowers of ornamentals but sometimes infest orchard crops. Fruits may be punctured and slightly deformed, but the injury is usually minimal. Controls: You can reduce the numbers by removing any female boxelder trees nearby. If this is not an option, then try handpicking and spray with rotenone. Inside the house, seal any cracks that may be in exterior walls.